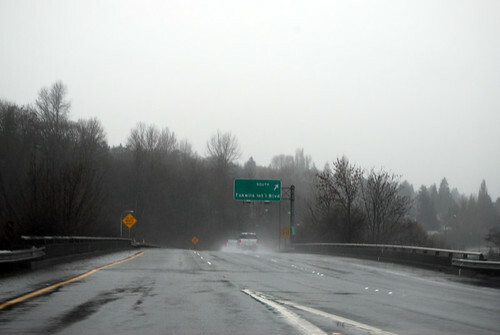 On Thursday, December 31, 2009, we drove the length of State Route 99 from near Tacoma to Everett. 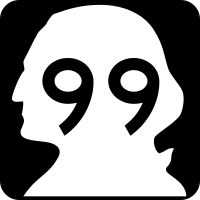 The current route is but a shadow of Washington's original US 99 that journeyed from Oregon to British Columbia. 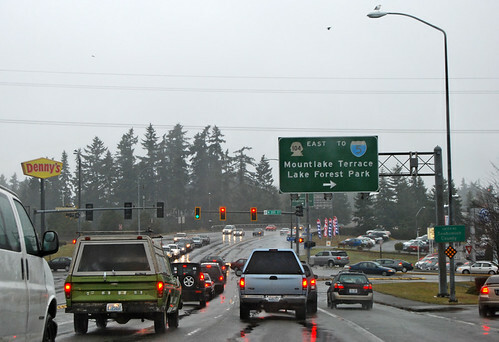 Beginning at a junction with state route number 599 in the vicinity of Tukwila, thence northerly by way of Seattle, Edmonds, and Lynnwood to a junction with state route number 5 in Everett: PROVIDED, That until state route number 509 is constructed and opened to traffic on an anticipated ultimate alignment from a junction with state route number 705 in Tacoma via the Port of Tacoma industrial area to a junction with state route number 18 in the vicinity of Federal Way that portion of state route number 99 between state route number 5 at Fife and state route number 18 in the vicinity of Federal Way shall remain on the state highway system. 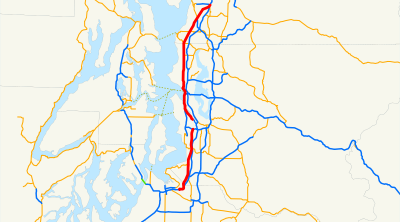 In the legal description above, Highway 99 is supposed to start in Federal Way, but the clause at the bottom tacks on the section from Fife to Highway 18. Since it doesn't say where compared to the other sections this final-clause section goes in the highway system, I let Chunlin convince me that it goes at the very beginning and not the end. Otherwise we'd've driven from Seattle to Federal Way to Everett to Fife to Federal Way to Seattle. So here we are at the overpass over I-5 in Fife, the current start of 99 in Washington. After a hundred yards or so, SR 99 arrives at the route of the old Pacific Highway, which it joins, heading parallel to I-5 east and then north through a surprisingly rural area. Up the hill we go to Federal Way and the junction with SR 18, the future start of 99 (likely long into the future, if ever). 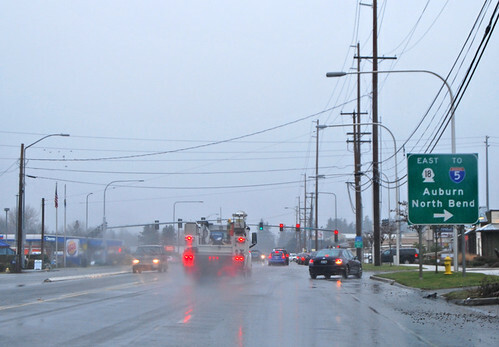 The name of Federal Way, of course, refers to US Route 99, which was completed through this area in the 1920s, whereas Federal Way School District -- the first use of the name -- was created in 1929. I guess they couldn't think up anything more descriptive? 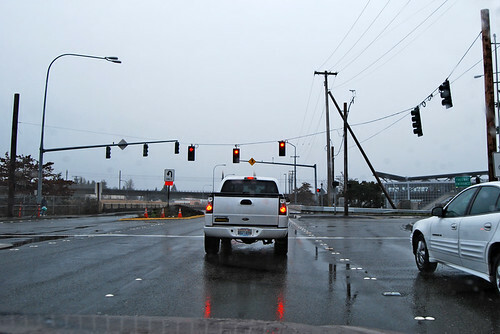 At the north end of Federal Way, SR 99 has the first of two junctions with SR 509. 509 is broken into two segments with a five mile gap between them; this is the north end of the southern segment. It'll take you to Dash Point State Park and back to Tacoma, if you'd like. Continuing north along the old Pacific Highway, we walk the line between Des Moines and Kent till we come to Kent-Des Moines Road, also known as SR 516. I guess these cities used to be farther apart. . . Notice the sign pointing to I-5. Since 99 is never more than a couple miles west of I-5, we got a sign directing us to the interstate for every on-ramp, it seemed. The sky fills with airplanes as we pass Sea-Tac Airport, driving through the city of SeaTac. Yes, they spell them differently. At the north end of the airport, SR 99 has a junction with SR 518, which is a freeway linking I-5 to the airport -- and Burien! Note the fancy new light rail station in the background right. Oddly enough, there is next a gap in SR 99, although no signs tell you such. 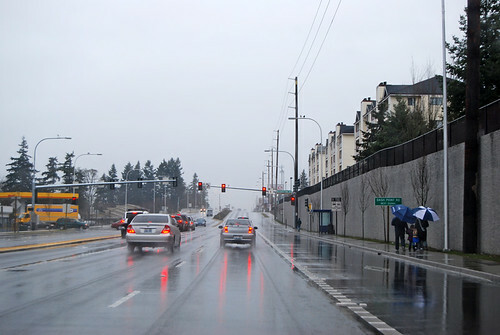 The street that once was the highway is now merely Tukwila International Boulevard. Down by the Duwamish River, there's suddenly a little sign for North 99 pointing at a ramp to the right, which leads you up to merge with SR 599. Highway 599 ends and 99 begins anew. Since 599 and 99 now link end-to-end and there's no parallel sections, I'd suggest making the 599 freeway part of 99. I don't think anyone would mourn the loss of 599 and it sure would make more sense than having a freeway change number at a seemingly unremarkable overpass. It felt good to drive a freeway after all the stoplights of Pacific Highway South. But even this stretch of freeway ended soon. 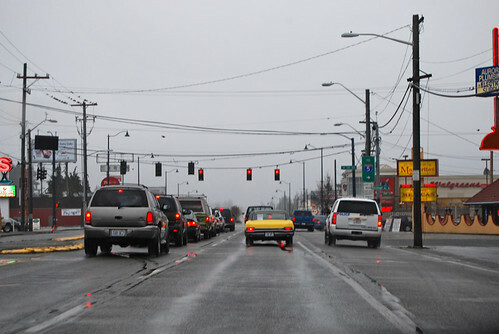 In the South Park neighborhood in south Seattle, 99 hits a stoplight, whereupon you must take a left to continue on 99. 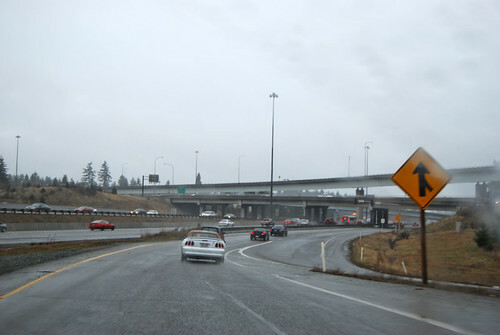 This is the second junction with SR 509 (which is a freeway at this point), marking the northern end of the northern segment of that route. Once again, the freeway changes number abruptly, this time from 509 to 99. 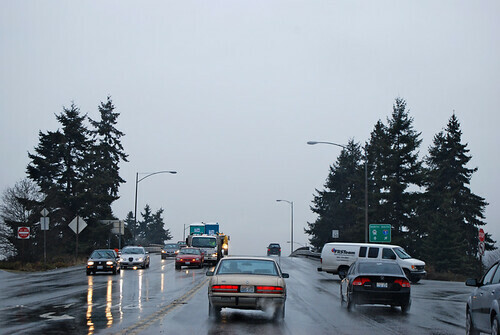 Highway 99 then manages to find its way along the full length of Seattle without another junction. We cross the Duwamish on the First Avenue South drawbridge, where the freeway ends, but after a mile of industrial arterial street, the freeway restarts as the Alaskan Way Viaduct. We fly past downtown and the waterfront with glorious views (except for the low clouds and constant rain) along the structure that the state has already started replacing. They're going to build a new viaduct for the half south of downtown and a tunnel under the central business district, emerging at the same location as 99's existing Battery Street Tunnel. 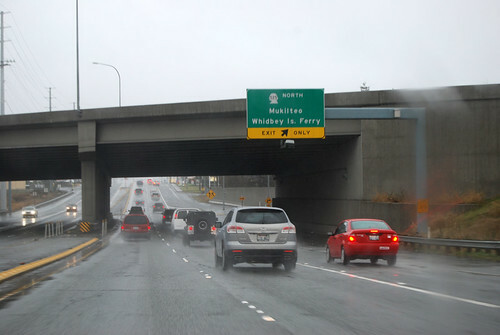 After said tunnel, we continue along increasingly familiar Aurora Avenue till we reach the junction with SR 523, better known to me as 145th Street and the northern boundary of Seattle. 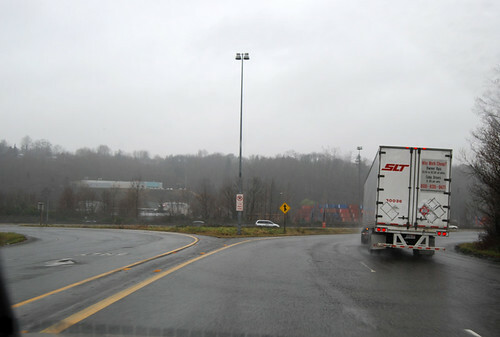 At the King/Snohomish county line (or just north of it), SR 99 has a junction with SR 104. The proper junction with 104 is in the distance in this photo; the sign in front is pointing at a shortcut to eastbound 104. Traffic is bad. 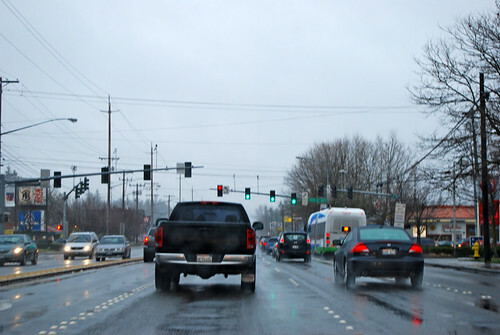 Even on an almost-holiday, Highway 99 is stop-and-go between the asynchronous stoplights. 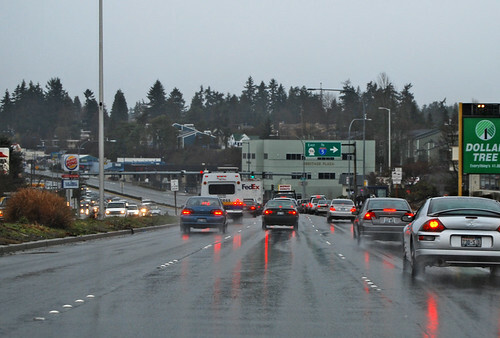 We finally reach the junction with SR 524 in Lynnwood. We leave Lynnwood, but it's hard to tell. Eventually we're at the junction with SR 525, which is a freeway at this point, connecting southeast back to I-5 and I-405. Northwestward, 525 heads for the Mukilteo ferry and Whidbey Island, as you can see on the sign. At the southern fringe of Everett, SR 99 leaves the old Pacific Highway (here called Evergreen Way) and cuts over toward I-5 on Everett Mall Way (previously called Broadway). Just past the mall, SR 99 flies over I-5 and merges going northbound. Trying to get to southbound I-5 would have led me to a junction with SR 526, but that also leaves SR 99 before the very end of the route. I must drive to the very end! It turned out to be a bad day for a drive, weather-wise and traffic-wise, but when a little rain is all I have to complain about in the heart of winter, it's not that bad. Which reminds me of Joe Walsh's "Life's Been Good" song I heard on the radio in the car 'round about Lynnwood (or was it Des Moines? ): "I can't complain but sometimes I still do. Life's been good to me so far." Yup. Life's been good to me so far. (Although none of the rest of the lyrics apply to me.) I'm free to drive this crazy scheme and I have a wife who joins me on the drives, takes photos for me, and still loves me. Hooray!